November 11, 2010 - Debris from the plane carrying three National Park Service employees in Katmai National Park was located on the park's rugged northern coast. Katmai National Park Superintendent Ralph Moore said he was notified by a local helicopter pilot, Sam Egli, that he had spotted portions of the aircraft, including a piece of the tail with identifying numbers, on a narrow section of beach about 10 miles northwest of Sukoi Bay. Egli told the park that there was no indication of survivors. The single engine floatplane, a deHavilland Beaver operated by Branch River Air Service in King Salmon, carried the pilot and three National Park Service maintenance employees and has been missing since August 21. National Park Service and military personnel have secured the debris and continue the search for additional wreckage. The accident investigation will be conducted by the National Transportation Safety Board. The discovery of the plane comes after more than a month of aerial and ground searching by national park, military and civilian personnel. More than 60,000 miles of flying was done, at times with more than a dozen aircraft working search patterns over the 4 million acre park. The area where the debris was found had been flown over by the National Park Service, and rangers had walked the beach just a few miles west of the debris site. 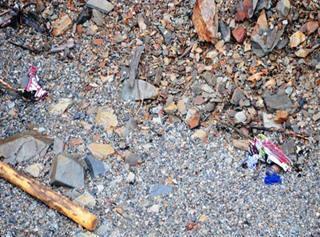 High tides and high east winds are thought to have helped make the debris visible from the air. Aerial searching by the U.S. Coast Guard on Wednesday confirmed the location of the wreckage along the beach of Katmai National Park east of the Douglas River. Small pieces of the aircraft were found, including a section located near the tail with identification numbers. No debris was seen on ground higher than the beach. The USCG helicopter crew did not land on the beach, and bad weather precluded the NPS from sending park rangers to the site. Determination of a cause of the accident will come from the National Transportation Safety Board, which has responsibility for the on-going investigation. The NPS will assist those investigators as requested, said Katmai NP Superintendent Ralph Moore, but outside of working with the NTSB no additional search work will be conducted. As no wreckage was found off the beach, all indications at this time point to an accident where the aircraft went into the water, he said. High tides and high east winds on are thought to have helped make the debris visible from the air by moving it onshore. The single engine floatplane, a deHavilland Beaver operated by Branch River Air Service in King Salmon, had been missing since August 21. The discovery was the first physical evidence found after more than a month of aerial and ground searching by national park, state, military and civilian personnel. More than 60,000 miles of flying was done, at times with more than a dozen aircraft working search patterns over the 4 million acre park as well as areas outside the park. The beach where the debris was found had been flown over by the National Park Service as recently as Monday, and rangers had walked the beach just a few miles west of the debris site.